“It’s been quite a whirlwind since Donald Trump was elected president on November 8th,” according to Estately. “President Obama flew off into the sunset, Trump enjoyed a concert by 3 Doors Down at a sparsely attended inauguration, and millions of protesters took to the streets in opposition. And while all this was happening, millions of Americans did what they always do— Google stuff. 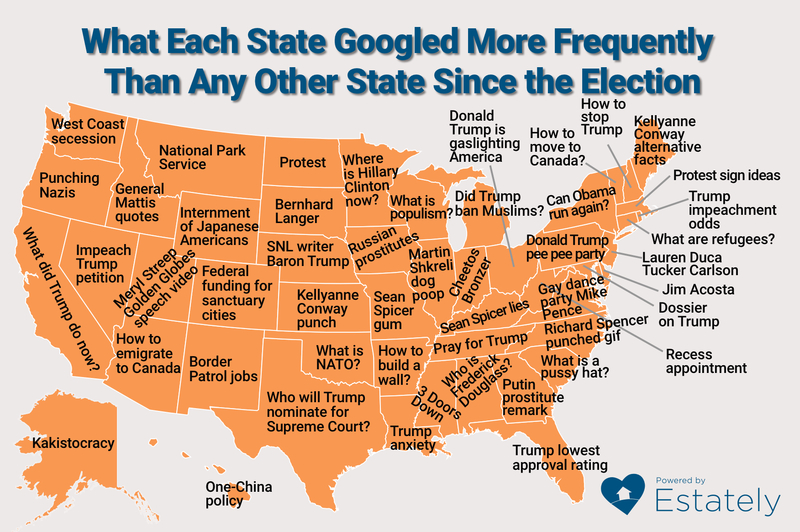 “Here at Estately, we were curious to find out what people in each state have been Googling since the election with more frequency than people in other states. To do this we used Google Trends to measure search traffic for hundreds of terms, names, and questions that relate to both current events and the new Donald Trump administration.